1. BBC Newsbeat wrote this report on how men can often slip through the net of anorexia diagnosis. Anorexia is a mental illness, but one that is often wrongly associated with only women. 17 year-old Charles Wooldridge let the BBC follow him on his journey as a boy with anorexia and explained his journey after he was diagnosed. 2. 16 women told Seventeen magazine about their experience of coming out to family and friends. Some changed their Facebook status, others shared the news over breakfast. Most importantly they all seem to have found acceptance among their friends and family. No doubt about about it, coming out is scary - but it shouldn't be a big deal. 3. Buzzfeed is having a body positivity week, which means they've got loads of awesome stories to have a look at. From Frostine the burlesque ballerina to 58 things you can do instead of worrying about your body and the beautiful pictures from Elle India's beauty issue, this week (much like every week!) Buzzfeed are getting all the good feels from the BBC BodyPositive team. 4. Katy Perry has spoken to Mashable about her role in helping women love their own body. She talks about the impossible beauty standards that women face, and says women just need to find out what works for them instead of labelling themselves. She said she's "not sample size" which represents most of us, and with all the drama surrounding social media and photoshopping she'd rather be relatable to her fans. 5. Royal Marine Lee Spencer has written in The Telegraph about the 10 things nobody tells you about losing a limb. He shares his experiences of having children stare at his prosthetic leg, and the weird trend for receiving free t-shirts. It's clear from the list that Lee has a great sense of humour - and he hasn't allowed his disability to slow him down. 6. Meghan Trainor caused quite a stir this week after taking down her new music video. This BBC Newsbeat story says Trainor was upset that her waist had been digitally altered in the Me Too music video (here's her Instagram post showing the shocking difference), and she hadn't approved it. Speaking on Snapchat about her embarrassment, she said it was still one of her favourite videos and she was very proud of it - so here it is on YouTube! 7. Lindy West has been on fire this week in the Guardian, and we particularly loved her piece about periods and how they really aren't the end of days like some would have you believe. She talks about what it was like when she got her first period and how it made her feel as a teenager who felt "too fat, too weird, too childish, too ungainly". She doesn't love having a period, but she doesn't think it should be a taboo either, and we totally agree. 8. In a world where we are taught that our wedding day MUST BE PERFECT, Amy Oestreicher felt suitably overwhelmed as she tried to find a dress that would also accommodate her two Ostomy bags. Ain 2005 Amy lost much of her digestive system, and after 27 surgeries all that remained of her "surgical disaster" were two bags to collect her waste. Her piece on XOJane explains how being beautiful is about more than two plastic bags. 9. Nine? 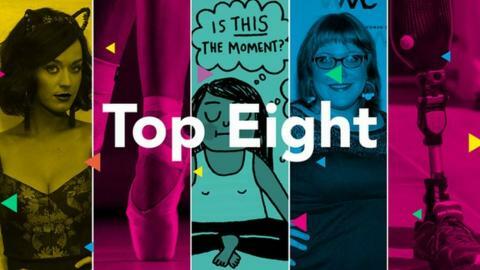 Yes, this week we have nine stories - because we couldn't miss out this piece by BBC News on whether employers can force women to wear heels. Here at BodyPositiveHQ we're all about comfy flats - what about you? Drop us a tweet or Facebook comment - links below.